Middle-class single mum Louise works as a secretary at a private psychiatry practice, where she is horrified to discover that her new boss, the handsome, charismatic David, is the very man she drunkenly snogged in a bar the previous night. Despite finding it impossible to suppress her feelings for him, when she (literally) bumps into his wife, Adele, the two women quickly become friends - and when Louise discovers that David is prescribing strong drugs for Adele, controlling her finances and checking up on her by phone at regular intervals, she starts to wonder whether the charming doctor she's fallen for is all that he seems. And what about beautiful, fragile Adele, who seems to know things about Louise and David that she couldn't possibly have witnessed? Who is telling the truth, and who is lying? And can Louise possibly sustain an affair with David and a friendship with Adele without either of them finding out that she knows the other? As you can probably guess from that description, Behind Her Eyes is primarily a psychological thriller, with all the hallmarks of that genre - flawed characters, a somewhat troubled female protagonist, unreliable narrators, sharp plot twists and intense relationships. However, there is also a plot strand that takes it beyond this. Louise suffers from night terrors, which leads her to practise 'lucid dreaming', a method by which nightmare sufferers learn to retain just enough consciousness to control their dreams and steer them in a less distressing direction. It soon becomes apparent that what she's doing is far more than that, weaving a mildly supernatural element into the story. Unfortunately, I don't think this quite works. The 'lucid dreaming' part of the story is essential to the plot, yet also somehow feels very minor and develops very slowly. I don't mind books that subvert or combine genres, but when I'd finished the book I felt dissatisfied with the way the paranormal part of the book felt like a cursory add-on for most of hte story, rather than being deftly woven into the action. I think people who are expecting a straightforward psychological thriller grounded in realism might be irritated with the lucid dreaming part of the storyline (which incidentally, I actually found quite dull for the most part) and people who enjoy supernatural fiction will probably feel that the scant treatment that part of the story gets doesn't really do it justice. I would have liked to see more commitment to the mix of genres and more equal time allocated to them. This doesn't feel like a combination of psychological and supernatural fiction - instead it feels like a psychological thriller with a jarring addition. Sarah Pinborough is best known as an author who writes fiction with a supernatural slant and I think Behind Her Eyes would be more satisfying if her expertise in this area was put to better use. Aside from this, I think it's fair to say that the characters are not groundbreaking - they're all very much recognisable types, including the supporting players - but they;re certainly not unrealistic and do come to life on the page. It's possible to root for Louise even when she's making extremely questionable decisions, of which there are many. The author also succeeds in making the reader hate Adele and/or David one moment and then feel sorry for them the next, which is very effective. This is very much a book in which you feel that you can't quite trust your own judgement. 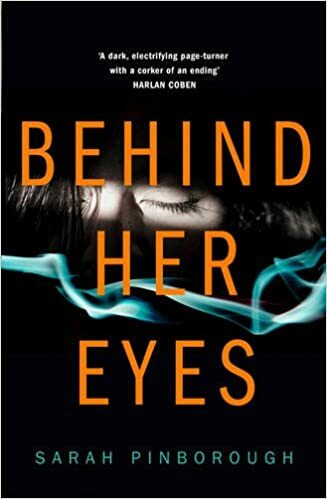 The promotional hype in advance of Behind Her Eyes being released has already put a strong emphasis on it having a shocking twist at the end, so I feel that I can mention this in the review without revealing anything that won't already have been talked about. I do agree that it's a belter of an ending, and although I was thinking in the vaguely the right direction, I didn't fully see it coming. I also think it was quite a brave choice by the author - it's impossible to say why without giving away spoilers, but all I will say is that it will leave a lot of readers feeling very uncomfortable. I'm grateful to the publisher for sending me, via NetGalley, a free copy of Behind Her Eyes for me to review. The book is due to be released in January 2017.